Notaí CLG Tulach an Iarainn 3/04/18 - Tallow, Co. Waterford, Ireland. 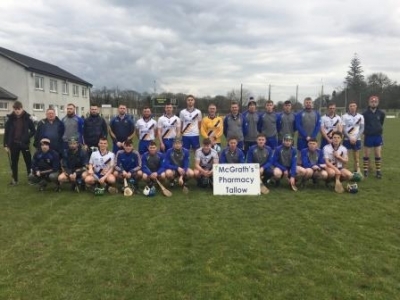 Our senior hurlers had their first championship outing of 2018 on Saturday last when they took on Dungarvan in Cappoquin. Underfoot conditions played a major part in the pace of this game from the outset but both teams handled it as well as possible. Dungarvan opened the game with a point from play to which Darragh Mulcahy replied with one of his own. Dungarvan put over three more in quick succession but Tallow were given a glimmer of hope when Thomas Daly rattled the Dungarvan net with a marvellous ground strike. However, this didn’t last long and Dungarvan responded with a goal of their own to put them four ahead. Thomas Ryan cut through the Dungarvan defence minutes later and fired it low to the bottom of the net to give Tallow their second goal of the game. Again, Dungarvan got one back almost immediately to put an end to any hopes of Tallow going in to half time in front. Tallow went in at half time trailing by six and they had it all to do in the second half. Both teams traded scores at the beginning of the second half, Dungarvan’s from play and Tallow’s from a pointed free. Tallow closed the gap to five points mid way through the second half with scores from Jordan Henley, Ian Beecher and Ryan Grey and they had a chance to bring it to four but this went astray. After this Dungarvan pulled away comfortably and ran out winners on a scoreline of 3-20 to 2-13. A disappointing result, but there were some positives to be taken from the game. The persistence and work rate from start to finish was admirable. They will hope to build on last weekend’s performance when they take on De La Salle this Sunday, April 8th, in Fraher Field at 2pm. We wish they the best of luck! The deadline for paying membership is fast approaching so if you have not paid your membership could you please do so as soon as possible. Our Junior hurling team started the year with an impressive win in difficult conditions for both teams in Aglish last Sunday. In front of a strong group of Tallow supporters we raced into an early 3pt lead with points from Noel Condon, Kevin Henley and a Billy Henley free. Thomas McGrath got the score of the game running up the left wing to score from distance to extend our lead to 4pts. In fact we lead 0-9 to 0-1 at one stage with further points from Kevin Henley, Thomas McGrath, Martin Murphy and young Eoin McGrath. Fourmilewater rallied and half time saw Tallow lead 0-9 to 0-4. With the wind picking up we found ourselves under strong pressure and eventually Fourmilewater tied the game at 0-9 each. Two pointed frees from James Murray and Kevin Henley kept us in contention before Conor McCarthy goaled to provide some breathing space before Kevin Henley provided the last score from a free. A good team performance saw us gain the victory and everyone played their part. A clean sheet for our injured captain Eoin Condon in goals was well earned. While our experienced half back line showed class is permanent, David Beecher at corner back stood out in the second half. Kieran Fraser and Thomas McGrath controlled the midfield battle and up front Kevin Henley was once again our talisman with a final tally of 5pts. Ably assisted by Noel Condon and young Eoin McGrath. ​Photo shows the Tallow senior hurling team who played Dungarvan on Saturday last.